Dare to be Special, Part 10: 7 Simple Steps to Break Free from the Grip of Mediocrity. Right Now. 7 Simple Steps to Break Free from the Grip of Mediocrity. Right Now. Do some of these hit home? If so, don’t shoot the messenger. But don’t get down on yourself, either. We have all been there before—and it can take an act of God, or near-death experience, to shock us out of the stuckness and lethargy of common behavior. My sincere hope is that this blog series, along with my other work, will inspire you and give you the tool set to break free, to be that “someone special” you know in your heart is possible. Considering the death grip that mediocrity has on most of the public, and all of the unhealthy behaviors and neurosis that such frustration and dissatisfaction produce, there’s a stunning irony at the heart of the story: The work required to be uncommon in today’s world is easier on the body-mind-spirit than the energy required to stay stuck in the numbing hell of mediocrity. You read that exactly right—the work to be uncommon is easier than the work it takes to maintain the status quo of being average. The energy drain from the things listed earlier will grind you down and make life hard. In the first part of this series I wrote that being uncommon is simply doing common things uncommonly well. The formula is to commit to doing the common things better, every day. It’s as simple and accessible as that. And when we do common things uncommonly well, the energy gained from the enhanced health, emotional balance, focus and clarity will make life a joy again. Listen Authentically: When you enter a conversation, whether with a child, your spouse or a stranger, actually listen to them. This means you keep your mouth shut and your mind still while you authentically seek to understand and empathize with their words and intentions. This alone will yield extraordinary results. With present and open-hearted listening, an invaluable level of trust begins to build, and you ascertain what is really important to those around you. Earn your “Trident” Every Day: Strive for a small percentage improvement in everything you do, all the time, from washing the dishes to your physical training to giving a presentation at work. Committing to daily, incremental improvements throughout your day means you are on the path toward virtuosity. You will soon notice how the respect that others have for you goes up and, in turn, your energy and performance will continue their ascent. Train, don’t just ‘Work Out’: Rather than embark upon another fad diet or declare some hazy resolution to “work out more” in 2015, fully commit to reach peak physical and mental shape by accomplishing a minimum of 150 Integrated Training Sessions next year. What do I mean by integrated training? See the next step for how to proceed. Engage all Five Mountains: When you execute a training session, purposefully combine the training of the body, mind and willpower by bundling Unbeatable Mind training of the mind, emotions, intuition and spirit into your physical training sessions. For example, when you step into the gym for a SEALFIT or CrossFit workout, go in with a complete plan so that during the workout you will attend not just to your physical strength and stamina, but all of the Five Mountains, again with the intention of making that incremental, small-percentage daily improvement in your ability to concentrate, your emotional control, your capacity to plug in and trust your intuition, and through this integrated challenge of earning your Trident every day, freeing up more of your spirit and spiritual energy. Shore up the Foundation: Take care of the basics each and every day. Start by stepping up your awareness of your habits in sleep and fueling. You’re probably aware of the correlation between a poor diet and the risk of type-2 diabetes. But did you know that same correlation exists between poor sleep habits and high blood sugar? You have to take care of the basics on a routine basis if you wish to attain optimal performance. Adequate sleep, balanced nutrition and integrated training are the foundation to living an uncommon life, SEALFIT style. If any one of these three are off, you will suffer performance degradation that continues to get worse until you re-balance the ship. So in 2015 don’t just wing it. Pay closer attention to your food and sleep habits using a feedback tracker such as Fitbit or Jawbone. Get Out of Your Head: Start to trust your gut and drop into your heart when making decisions. Learning to do this takes patience, and more silence. Do or Do Not, There is No Try: Finally, commitment to excellence is a one-way trip. You commit and act when you have developed the knowledge and skills, or you should not try. 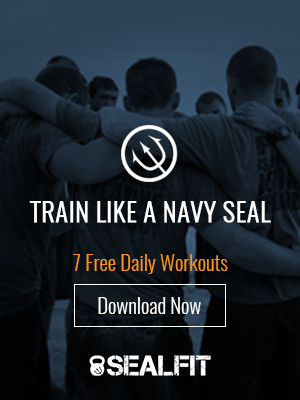 Let’s do this – Hooyah!. PS: Thanks to everyone who attended the Warrior Yoga seminar and Unbeatable Mind Retreat last week. It was an incredible week and we came away with great energy and ideas for next year. If you missed it, please plan to attend next year, it is truly an extraordinary event.